How to Measure A Snare Drum? Players have a lot of freedom when choosing snares, but it is important to correctly measure a snare to get a feel for how it will sound before buying one. The dimensions of a snare drum will affect not only the sound that you hear, but also the whole mix if we’re talking about a studio recording. Of course, a drum’s dimensions are important when buying cases for your drums. In short, snare drums are measured by taking the diameter and the height. Most often, snare dimensions are stated as height by diameter of the shell itself without the hoops. In addition to that, drum heads are sold by diameter so you’d need to know the diameter of the snare drum before acquiring a new head. Take a measuring tape from the inside of the rim from one lug on the hoop or rim to the other directly across from it. 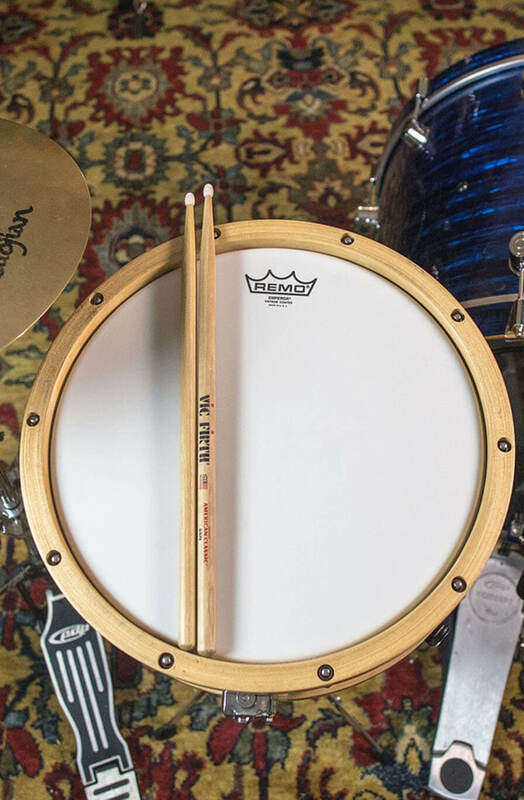 To measure the width of a snare correctly, one should remove the drum head from the top or bottom. Once the head is off of the drum, we can measure just the shell from the outside edge directly across the center of the shell. Drummers have different preferences on what drum sizes they want, and because of that, you should generally do a little bit of research before buying a new snare. A rule of thumb is that the smaller diameter drums have a higher basal pitch. Usually, one can take a 13 snare drum and tune it lower to sound like a 14 inch snare, or vice-versa. However, drummers usually use choose their drum’s size, heads, and shell material for specific sounds. One might keep a 10 inch in their rig for sharp accents, with a 15 inch fat-sounding main snare, for example. The depth of a drum adds to its richness of tone. If we’re talking about snare drums, it may add to its difficulty to play on a drumset. For example, “Banjo” or “Pancake”-style snares are really snappy, often used in Zydeco, Creole and Cajun music. Metal players might prefer deeper snares. The sound of a snare is dependent on the material and dimensions of the drum. Snare drums may be made from various wood, metal, acrylic or fiberglass. A typical diameter for snare drums is 14 inch. Marching snare drums are deeper (taller) in size than snare drums normally used for orchestral or drum kit purposes, often measuring 12 inch deep (tall). Orchestral and drum kit snare drum shells are about 6 inch deep. Piccolo snare drums are even shallower at about 3 inch deep. Soprano, popcorn, and firecracker snare drums have diameters as small as 8 inch and are often used for higher-pitched special effects. For more information on drums and music in general, take a look at our drums section or visit our home page. Don’t forget to comment and share our article and keep on rocking!